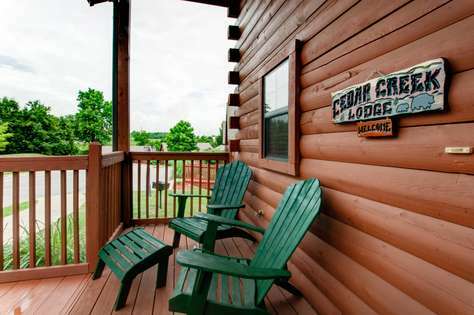 Our spacious Cedar Creek Lodge is a 3 bedroom, 2 full bathroom cabin nestled back in a community that is dedicated to the rustic cabin experience and is surrounded by the natural beauty of the Ozarks all while being at the heart of Branson entertainment district. 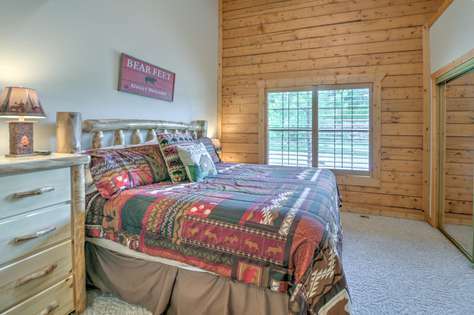 ​Come enjoy all the fun that Branson has to offer, then return to your own cabin in just minutes , where you can relax and recharge for the next day's adventures. Be sure to check out our list of favorites for entertainment, shows, dining, and outdoor activities. 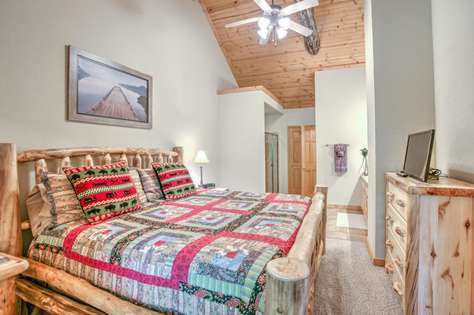 ​We welcome you and your family to our cabin and we hope you will make family memories that will last a lifetime. See you again next year! This property has 3 King(s), 1 Pull Out Sofa(s). A reservation deposit of $200 is required. This must be received within five (5) days of booking the reservation, three (3) days if 30 days or less to arrival time. The deposit automatically converts to a security/damage deposit upon arrival. The deposit is NOT applied toward rent; however, it is fully refundable within (7) days of departure, provided the following provisions are met. •	NO early check-in or late checkout. My family and I stayed here for our annual women's trip. The cabin was absolutely gorgeous! We all loved it. The beds were comfortable. The house had everything you needed. The screened in deck was very nice. One of the best things about the property was its location. It is in the middle of everything, so anywhere you want to go is just down the street. I could've walked to the Tanger Outlet Mall if I wanted to. We will definitely stay there again. We have already discussed it. The cabin was perfect for us! There was plenty of room for the 3 adults and 2 kids on our stay. Everything was clean and tidy upon arrival. All of the adults were impressed by how comfortable the beds were. It was conveniently located to all of the attractions we wanted to see. Before we left, we were already talking about when we could come back. I will definitely be recommending it to my friends and family! Our first trip to Branson, and we certainly will be back. Cabin is beautiful, and where you spend your down time is just as important, and we didn't even want to leave the cabin! Plenty of linens, dishes, and everything you need to start your day and end your night. 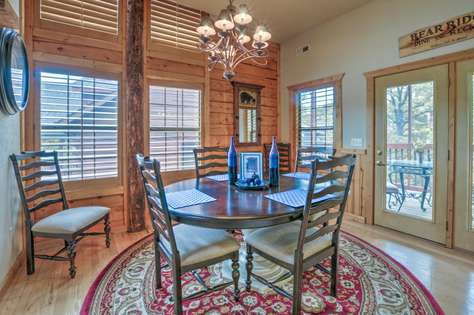 The entire cabin is furnished and up to date inside and out. Looking forward to our next trip. Thank You ! The cabin was absolutely amazing!! I don't think I could have been happier with our choice! The cabin was beautiful and it was right by the strip a made traveling really easy. Glad I found this cabin and I will be using it again for my next visit! My grandmother, mother, and I go on vacation annual. This is the first time we chose to stay at a vacation rental instead of getting three hotel rooms. We love each other, but enjoy our own space. 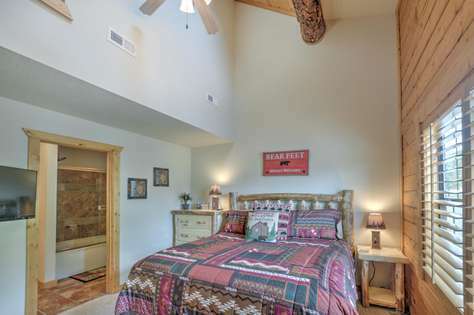 Cedar Creek Lodge provided that and more! First, the location is absolutely incredible. It's basically no more than 10 to 15 minutes away from everything: the strip (2 mins up the hill), the outlets, scenic downtown, the lake area, the zoo, theatres, and grocery shopping. That alone makes Cedar a terrific place to stay. 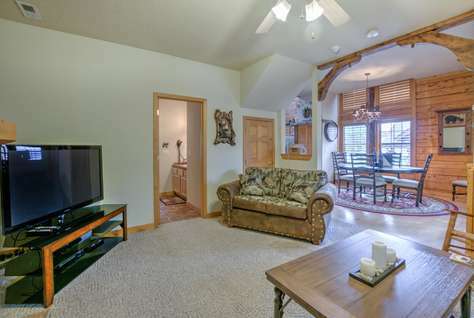 Secondly, the townhome cabin is exactly as advertised. Clean, inviting, and immensely spacious. Each one of us had our own room and TV. 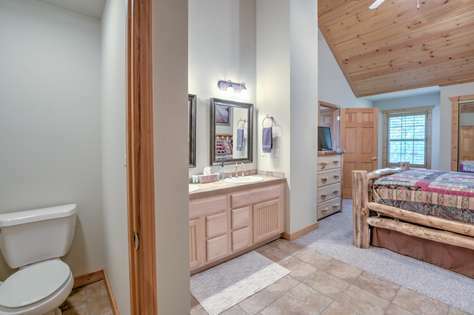 Plus, my grandmother enjoyed the master bedroom on the ground floor with her own bathroom. We were all extremely happy with the layout. Finally, the owner, Chris, was so easy to deal with. He answers emails almost immediately, and was very helpful during our booking through our departure. 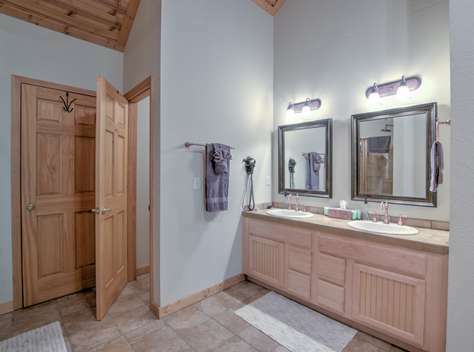 Plus, he leaves ample "starter" products in the cuboards and bathrooms. Overall, you can not go wrong with this place. Next year, when we chose a new place to visit we hope the rental we chose is half as good as Cedar Creek was. This was a great house, location, and all around great experience. Chris was very friendly and easy to work with! We will definitely look to stay here again if are ever vacationing in Branson again! I watch a lot of HGTV, so I know how important location is. 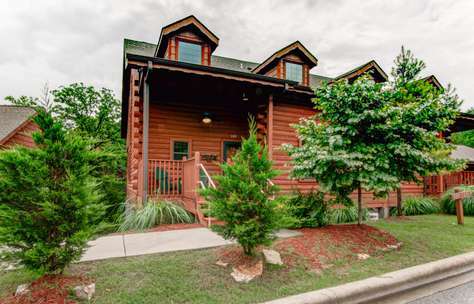 This cabin at Cedar Creek Lodge has the absolutely best location in the entire city. We are 5-15 minutes from everything. It's literally 3 minutes to the 76 strip to see the shows. It's minutes from the Outlets. 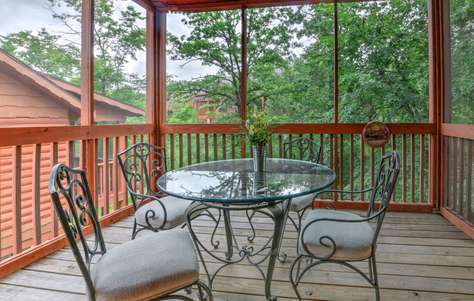 Minutes to Shepard Hill, and less than 15 minutes to Branson Landing/Lake area. We couldn't be more pleased with the location. As for the property, it is exactly as advertised! It's beautiful, exceptionally clean, spacious, and includes all the necessary amenities of home. Moreover, the owner, Chris, was fantastic to deal with throughout the entire process. I would highly recommend this rental to anyone looking for great location along with very spacious accommodations. Loved the cabin. Very close to everything on the strip and easy to get to all of our shows. Comfortable beds as well. Nice facility, clean and plenty of room for the family to gather. We highly recommend Cedar Creek Lodge. We've been coming to Branson for decades and never knew this place existed. Definitely the best place we have found to stay. The location is perfect, everything is clean and comfortable, and the area is incredibly quiet considering how close it is to the strip. Only noise we noticed was the helicopter that flies over regularly. 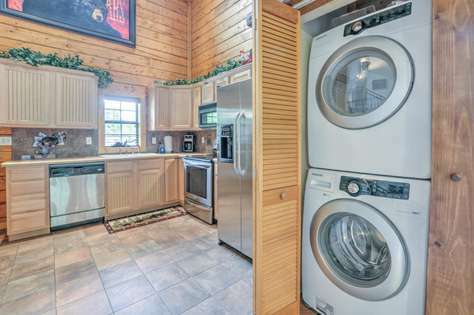 The only thing I would change about it would be to add laundry machines. We will definitely be back! The property itself was perfect for what we needed. The beds were so comfortable none of us wanted to get out of them. I would recommend it to our friends and family. Thank you for making our vacation smooth and comfortable. We just stayed at your cabin and loved it. We had plenty of room to feel comfortable and enjoyed the king size beds along with the dual shower and whirlpool tub. We did not use the kitchen much but we could have. 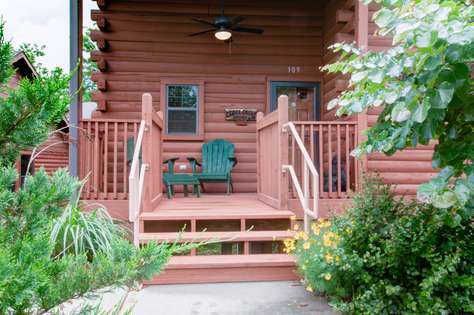 It is just lovely and I would recommend this cabin/vrbo to anyone spending time in Branson. Ours was a "girls" get away! This property was perfect. Three spacious bedrooms two bath with all the conforms of home. Plenty of room for relaxing after a day at activities. This would be the perfect weekend/ week vacation for a family as well. Plenty of privacy, we didn't feel like we were right in the midst of the action but we were. Centrally located, convenient to everything, the mall, shows, restrauants everything! This is your home away from home in Branson! The most accommodating host we have encountered and we do this at various locations twice a year. Perfect in every way. 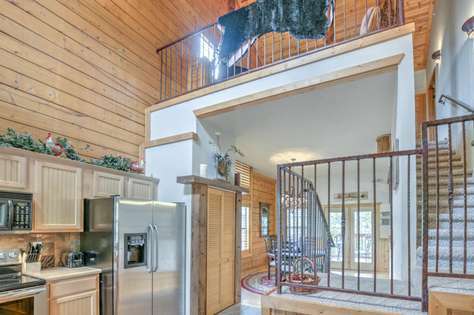 This cabin is located within minutes of attractions and restaurants. Chris always responded to any questions I asked and the cabin is amazing and very upscale. I would rent again for sure. Loved this cabin. Would gladly come back again to stay. It is right off the main strip and behind the outlet malls. It was roomy enough for my parents, me, my spouse, and 3 kids. I absolutely loved the mattresses! All 3 beds had wonderful pillow top mattresses so I slept very well which is unusual when I travel. Thank you so much for letting us stay there!! My family loved staying at Cedar Creek Lodge! It was perfect for our family of 5. We would definitely stay here again! My parents, my sister's family (including two kids), myself and my significant other stayed in this cabin. It was great to be able to cook and eat in rather than having to find a restaurant. And there were plenty of dishes and utensils available for all 8 of us to help prep the meal then enjoy it together. The cabin was clean and well decorated with plenty of space for everyone. Great experience! Family trip with 6 adults and two kids. We had the best time ever. The cabin was in great shape, very clean and beautifully decorated. The furniture was awesome and the mattresses were like heaven. The gas fireplace was very nice on the chilly mornings and the screened deck was very. Ice in the warm afternoons. The owner was more than great at responding to the reservation and any questions I had. He even did a little extra just to make our stay even more perfect. We all agree that we would definitely stay there again and everyone in the family took one of his cards for future stays! Great location! In the heart of Branson but feels like you are in the woods. I would highly recommend. Every fall, my wife and I treat our two sons and their families to a weekend in Branson. We usually stay in condos. This year, I decided to book a cabin. After walking into the cabin, I realized I had made the right decision, especially when one of my sons commented, " Dad, you really outdid yourself this time!" He was right about Cedar Creek Lodge. It was by far the best accommodations we have ever had in Branson. Everything was near perfect. 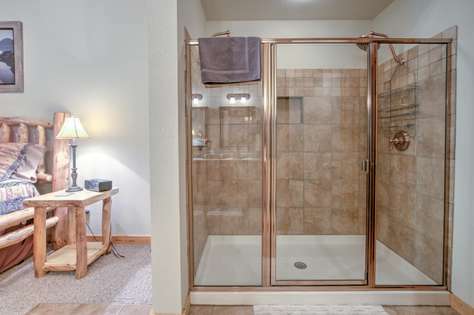 The owner's cooperative and helpful manner, the cleanliness of the cabin, and the updated furnishings and appliances made this an extremely enjoyable stay. We especially enjoyed morning coffee on the screened porch and warm evenings around the gas fireplace. I will definitely keep Cedar Creek Lodge at the top of my list for next year! Every fall, my wife and I treat our two sons and their families to a weekend in Branson. We usually stay in condos. This year, I decided to book a cabin. After walking into the cabin, I realized I had made the right decision, especially when one of my sons commented, " Dad, you really outdid yourself this time!" He was right about Cedar Creek Lodge. It was by far the best accommodations we have ever had in Branson. Everything was near perfect. The owner's cooperative and helpful manner, the cleanliness of the cabin, and the updated furnishings and appliances made this an extremely enjoyable stay. We especially enjoyed morning coffee on the screened porch and warm evenings around the gas fireplace. I will definitely keep Cedar Creek Lodge at the top of my list for next year! We had a great vacation, the house is clean and in a great location. We would stay here again! 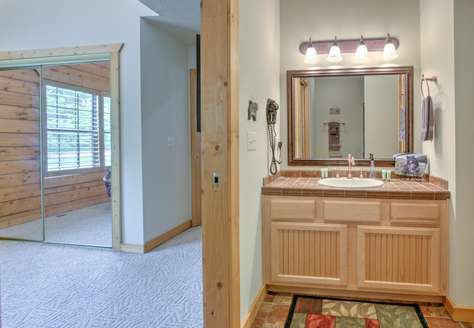 The 3-bedroom cabin was exactly as described. 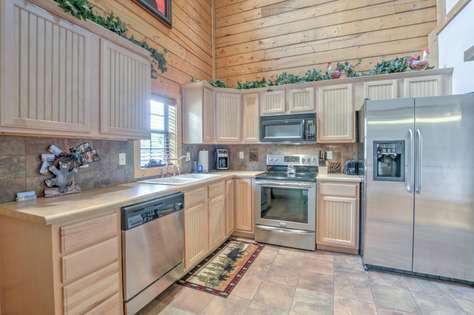 The kitchen and dining areas were large and had everything we needed. Enjoyed spending time on the screened-in back porch as well. The interior was very clean and everything was in perfect condition. Beds were all comfy; bathrooms were large. The owner was very easy to work with and was always prompt in replying or answering questions for us. The location was extremely convenient to the main highway through Branson, but we did not hear any traffic noise and enjoyed complete peace and quiet. Would definitely contact this owner for future vacation rental plans. Very well maintained and clean. Owners were great to deal with. Great location to shops, restaurants, golf and marinas! We thoroughly enjoyed our time there and would recommend it to any couple or family. Chris was amazing at answering question and was very fast to responded. The cabin was very cozy, clean and very nice. It felt like home. It had everything you could possibly think of to cook with. The area of the cabin is located just minutes from Tanger and other attractions. It was very quite place. Plenty of room for 5 people and more. We look forward to staying here again..
Beautiful Cabin! We loved it from top to bottom. Felt very peaceful there. Quiet neighborhood. Landscaping was very nice also. Would have been nice if the ice and water on the frig. worked. There was no DVD player to watch movies either. So you might want to bring your own. Everything else was awesome! Thank you! This was a very quiet - off the beaten path, yet extremely close to the "Strip" in Branson. All the shows were a short drive away! The description of this property was very accurate. It was clean, and all the beds were wonderful. We will surely do our best to get this property for our next trip to Branson!!! Our host was magnificent to work with! I loved loved loved this cabin! There's was plenty of room for everyone only complaint was the mattress on the hidabed you could fill the bar and it doesn't sleep comfortably but other than that it was amazing! Us girls had plenty of room to get ready for our night out and we weren't standing on top of each other!. Response: Hide-a-beds are not always the most comfortable. We have an upgraded mattress to help, but will look at other options. 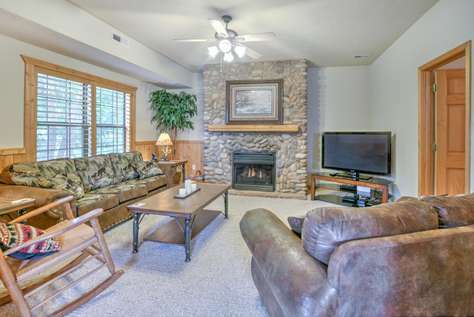 Our family of six recently enjoyed this nicely decorated and spacious cabin. Three King size beds and two bathrooms were perfect. Our twin sons of almost 20 enjoyed the loft area and were able to chill out and enjoy the Olympics on the big screen tv. Our family prepared and ate almost all of our meals while vacationing and appreciated the full kitchen and dining table for six. Maybe could think about adding a few more things like a portable mixer and some measuring cups and spoons, some tongs, a large drinking pitcher, etc. It was a great location - close to the strip and Tanger outlet mall. If we needed anything, Chris was on top of it and responded quickly. Would be nice if the gate near the cabin was open more frequently to get in and out of the Grand Mountain Cabin community. Thank you Chris and Carol for allowing us to stay at your cabin. Update: Thanks for the ideas for additional kitchen items. Six of my "40-something" year old high school classmates/friends get together every summer for a girls' trip. This cabin was PERFECT!! The three king beds, the living area that seated us all perfectly, and the convenient location is what sold me when trying to find a place for us all to stay. It was wonderfully decorated, very clean, and well stocked. We will definitely be staying there again. Thanks!! We really enjoyed our stay. The cabin was very comfortable, and all the things we needed were provided. 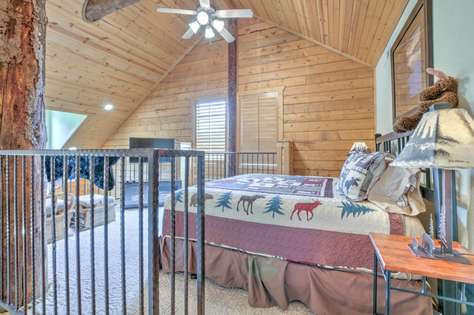 Our family would recommend this cabin to anyone interested in visiting Branson. thank you so much for sharing your home! It was very relaxing, and we felt at home. We will definitely be going back!! Our family of 4 joined up with another couple to stay at this condo. The beds were fabulous and there are tons of pillows. Everything is very nice and clean. The screened in back porch was a nice bonus in the mornings. We enjoyed our stay and would definitely recommend this property to anyone looking to stay in Branson, MO. We had a wonderful visit to this beautiful cabin! It is very convenient to the strip. We would highly recommend Cedar Creek Lodge. Every detail of this Cabin is gorgeous. And the access to the pool/arcade/fitness center in the nearby hotel completely made our stay! Our kids had never played the game Clue and we had such a cozy time teaching them. So thankful the board games were there. 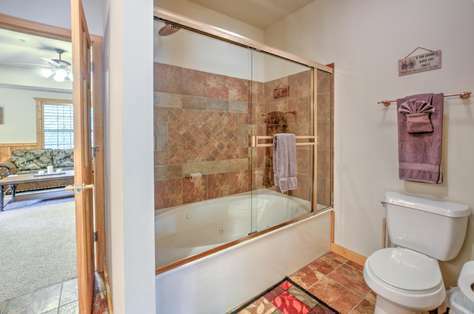 The jetted tub downstairs was my sanctuary and the cool shower upstairs was my husbands favorite. I wish the ice and water was working in the fridge but that was small compared to how nice everything else was. And the owner was so helpful and accommodating. We will definitely stay here again. I hope soon! Glad everyone had a great time. We agree on the icemaker and have the parts ordered that hopefully should do the trick! My family and I stayed in this cabin and it is awesome! It was perfect for 8 people! it felt like you were in the woods but so close to everything! The new furniture and décor were awesome!! They provided us with all the essential things we would need. I would highly recommend Cedar Creek to anyone! The owners are very nice and helpful! When we go back to Branson we will be staying at Cedar Creek again!! Bookings already started for 2019! Grab your dates now.